Shamkir (Azerbaijani: Şəmkir) is a rayon in Azerbaijan. It is located in the northwestern part of the Azerbaijan Republic. The rayon was previously called "Shamkhor" during the Soviet rule and was renamed to Shamkir only in 1991 after restoration of independence of Azerbaijan. The district was established in 1930. The capital of Shamkir Rayon is Shamkir city. There is one city, Shamkir city, 4 city-type settlements Chinarlı settlement, Dallar settlement, Zayam settlement, Kura settlement and 59 villages in the district. There are 59 large and middle-size, 53 pre-school, 81 secondary education, 1 technical vocational establishments, 22 hospitals and healthcare offices, 156 cultural establishments in the raion. Shamikir shares a border with Goygol, Gadabay, Dashkasan, Tovuz, Samukh raions. The population of the district is 192,900 people with 33.49% being urban and 66.51% living in the country. An estimated population density 113.49 person/km2 Men constitute 49.58% of the population, women - 50.42%. Children make up 11.26% of the population, while 33.18% of overall district population are residents below the age of 18, 57.86% are from 18 to 60 years of age. 5.79% have higher education, 56.1% have secondary education only. The number of refugees and IDPs from Nagorno-Karabakh conflict is 12,240 and 1,897, respectively. In the Middle Ages, Arab and Persian sources mentioned the city name as Şəmkür (Shamkur), Turkish sources varied from Şəmkür (Shamkur) to Şəmkir (Shamkir). Historian Zeynaloğlu who published a book on comprehensive history of Azerbaijan in 1924 in Istanbul he argued that name was translated as Şəms (Sun) - Kür (Rayed). Jahangirov explained otherwise referring to Şəm (Bank of) - Kür (Kür river), i.e. on the bank of the Kura River. The ruins of ancient Shamkir city which was in the form of a fortress and was 20 ha big is located on the right bank of the Kura river. The city had two bridges over Kura. In the 7th century the city was occupied by the Arabian Caliphate and was named Mütəvəkkilliyə. It was renamed back to its original name later. The times of prosperity of Shamkir are attributed to 9th-12th centuries when it was conquered by Seljuqs. In the 12th century when Shamkir was a part of Atabek Empire, special attention was given to the city. In the 13th century Shamkir was one of the main points of resistance to Mongol invasion. In the 16th century, the leader of local Zülqədəz tribe took the power. During the existence of Azerbaijani khanates, Shamkir was part of Ganja khanate. In 1803, Shamkir was occupied by and annexed to the Russian Empire. During the Russo-Persian War of 1826-1828, Shamkir was one of the frontlines where Russian troops defeated the Persian army on September 3, 1826. In the first half of the 19th century, Russian Tsar relocated a large number of German colonists to Caucasus, placing a big community in Shamkir. From that time on until 1938, Shamkhor was called Anino. It was renamed to Shamkir in 1991. Historic architectural monuments include 9th-12th century Shamkir city ruins, 9th-12th Shamkir bridge, 11th-12th century Shamkir fortress in Muxtariyyət village, Baydar city ruins in Bayramlı village, 9th-12th century Maiden Tower in Seyfali village, 16th-17th-century mosque in Abbaslı village, 11th century Maiden Tower in Tatarlı village, 16th-17th-century bridge in Tahnalı village, 16th-17th century Koroglu fortress in Şəmkir, Qalaboynu Fortress in Atabəy village, Pir monument from early Middle Ages pertaining to Caucasian Albania in Daşbulaq village, a church built in 1909 by German settlers in Şəmkir, 11th-12th century Oghuz cemetery in Yeni Seyfali village, 16th-18th-century bridge over Zəyəm River. 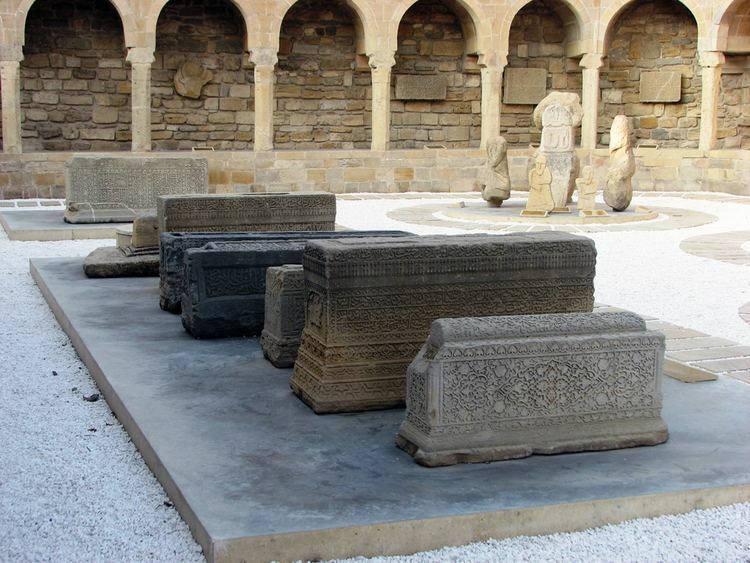 During archaeological excavations carried out by a joint Azerbaijani-German expedition since 2006, ruins of an ancient Achaemenid palace were discovered near Qaracəmirli. Among the modern built monuments are the Victory Complex built in 1975 in Şəmkir city, mosque in Düyərli village, Victory Complex in Çinarlı settlement built in 1980, memorials to Black January in Sərxan and Naxırçılar neighborhoods of Şəmkir city unveiled in 1990, Ashig Huseyn Shamkirli monument unveiled in 1991, Ali-Agha Shikhlinski bust, mosque built in 1992 in Keçili village, a 1993 Koroglu monument in Muxtariyyə village, bust of Azerbaijani National Hero, Zaur Sarıyev, Alley of Martyrs to people who died from Armenian occupation. mosque built in 1998 in İrmaşlı village, Heydar Aliyev spring built in 1998, a Memorial to Azerbaijani Genocide of March 31, 1918 built in 2001, mosque built in Əliyaqublu village in 1998, Memorial to Azerbaijani Genocide victims in Qapanlı village, a 2001 monument to Yəhyabəy Dilqəm in Dəllər Cırdaxan village, monument to Ashig Alasgar, unveiled in 1997 in Çənlibel village. Municipality government was established in 1999. There are 57 municipalities in 64 populated settlements. One city, 4 settlement and 52 village municipalities function as regional governments The role of the municipalities expands as the renovation and city, village development, laying roads and development of social infrastructure continue. The economy of the raion is based on poultry raising, cattlebreeding and silkworm breeding. Agricultural machinery production, grape processing plants, construction plants constitute a big part of the economy. Wheat, barley, corn, grapes, onion, cabbage, tomato, cucumber, aubergine, sunflower, potato are grown in the raion. Electricity is received through power generation at Shamkir Hydroelectric Power Station on Shamkir reservoir which processes water from Kura River and also provides Shamkir and surrounding rayons with irrigation water. The new reservoir in the rayon will double that capacity and will come online in 2012. 2nd Shamkir Winery was established and operated in 1860-1896 by Christo Forer brothers and is active at the present. As of 2014, the city is hosting Shamkir Chess tournament in honour of the memory of the chess grandmaster Vugar Gashimov. Mübariz Qurbanlı, deputy chief of Yeni Azerbaijan Party.